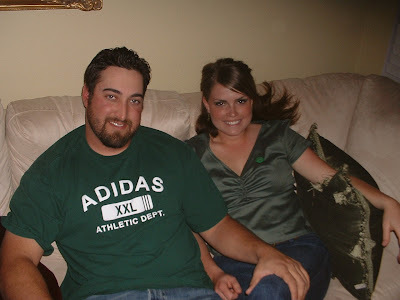 Here is Nathan and me 3 years ago on St. Patrick's Day at my parent's old house. My oldest sister Amber was in town from Texas, and she being the queen of festivity, insisted we celebrate this holiday in style. The dining table was decked with a green table cloth and green balloons and ribbons were hanging from the chandelier. We ate Corn Beef and all and everyone wore green. Nathan was such a sport. He was not used to my family at this point, we had only started dating less than a month before, and he bore through all the festivities. He even pulled out a green Adidas shirt from the bottom of his closet. Bless his little heart.